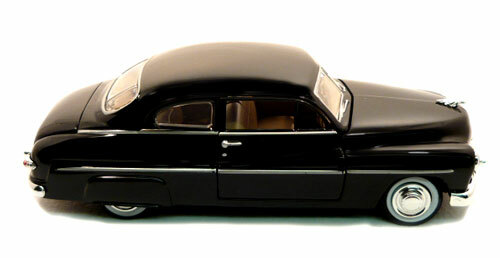 Check out this classic 1949 Ford Mercury 1:24th scale by Motor Max Collectors Series. The hood opens to reveal a detailed chrome engine. The doors open to a tan interior with bench seat. The detail is great on the interior of this classic oldie. It comes with stock Ford wheel and white wall tires. = 8 inches Long x 3 inches Wide x 2.5 inches High. = Shipping weight is 1.1 lbs.